Earlier this year, I had the privilege of making a pilgrimage to Israel with other Anglican clergy. It was incredible. Our first few days were spent in the desert, and even in February, the climate was warm and pleasant. But our final desert day was particularly warm, and we even had an opportunity to swim in the Dead Sea! Afterward, we boarded the bus and drove about an hour to Jerusalem, passing Jericho along the way. 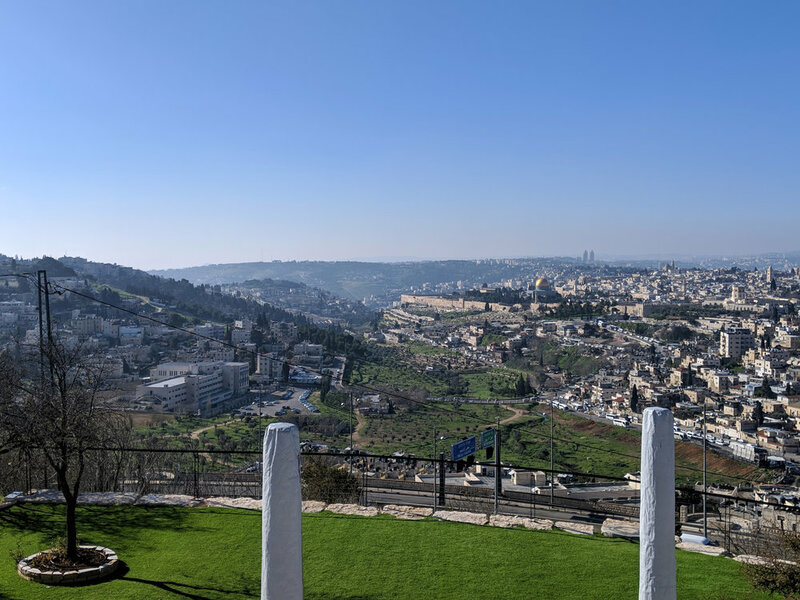 When we arrived at the gates of the Old City, I was still wearing my “beach attire” – swim trunks and t-shirt, a fashion choice that not only screamed “American!” but also left me shivering: the temperature had dropped by about 15 degrees. This route from the Dead Sea to Jerusalem – the same one that we’ll read of Jesus taking in our devotionals this week – involves a long, steady upward climb. It begins at the lowest point on earth, nearly 1,400 feet below sea level, and ends at 2,500 feet above sea level. And while the physical temperatures drop sharply along the way, when Jesus made the climb for the final time before his passion, he found the “spiritual” temperatures around him rising. That is, as he made his way toward Jerusalem, the “heat” of opposition against him began to increase. In the passage we’ll read tomorrow, while near the Dead Sea, Jesus tells his disciples that he will soon be “delivered over … and will be mocked and shamefully treated and spit upon. And after flogging him, they will kill him.” A few passages later, King Jesus rides into Jerusalem on a colt, and immediately we read that “the chief priests and the scribes and the principal men of the people were seeking to destroy him.” As Jesus moved progressively deeper into the heart of a religious establishment bent against his kingship, fears were stoked and emotions were flared. The spiritual air around him sizzled. As it was in Jesus’ day, so it is in ours. When we follow God closely and seek to walk in His will, He will lead us to bring His kingdom light into the heart of enemy territory, and as a result, we will often experience increased spiritual heat, or pushback. The enemy may seek to exploit vulnerabilities in our relationships. We may experience increased temptation in areas of weakness, or be fed certain lies we’re prone to believe. We may suffer physical illness or injury. Jesus said we are to expect such things to happen (cf. John 16:33). But how should we respond when they do? First, we need to recognize these attacks for what they are … to wake up to the reality that we are constantly in the midst of a spiritual battle (cf. Eph 6:12). Second, we need to be encouraged. The enemy doesn’t push back unless he feels threatened. The experience of spiritual heat is a backhanded compliment: you are on the right road! Finally, we need to pray for protection daily, and especially at moments when we feel the heat rising. Lord, thank you for the privilege of participating in your Kingdom work. Help me to recognize spiritual heat when it occurs, and to not be surprised, but rather encouraged, when it does. And please protect me and all of your church from the attacks of the enemy. I ask these things in Jesus’ name. Amen. The Rev. Will Shafferman is one of our pastors here at The Falls Church Anglican. He has been married to the lovely Ashley for 8 years and they are expecting their first child on Easter day.